While reading a review of the New Museum’s upcoming triennial in the NYTimes (“Where Virtual Equals Real”), I was thinking how my creative impulses couldn’t be much further afield. This exhibition is dominated by digital dystopias tackling what the article described as “post-human and post-internet.” Author Brian Siebert defines post-internet not as being beyond the internet, but rather that the internet is so normalized and embedded in our lives that it has become us (or we have become it): an “Internet state of mind” (quoted from “Art Post-Internet” by curators Karen Archey and Robi Peckham). When I dare to catch up on the news, this dystopic world looms large—perpetual wars and conflicts, beheadings, drones and robots, police brutality, the gulf between the ultra rich and everyone else, the erosion of the humanities and liberal arts education. All the values I hold dear, on which I have based my life, have been pushed to the margins at best. My response is to retreat—slow down if not stop, unplug, observe closely, listen intently, and above all, take a deep dive into nature. I am sure that there is utility in drones and robots, in that machine-made, human-dominant world, but while that world is spreading ever wider, subsuming everything in its path, the more-than-human world is dying. I will not list out all the ways non-human nature is gasping for water, air, and space to BE. Anyone who is awake knows this. What troubles me greatly is that the critical mass of humans on this earth are more interested in their devices, gadgets and toys than in the miraculous wonder of life that is in serious decline. What alarms me is that the human world is becoming the ONLY world—it’s all about US. Twitter reflects this perfectly. Undoubtedly, there is useful information being tweeted. But, how much of what is on Twitter is useful, and how much of it is ME, ME, ME? I visited a retrospective exhibition of the artist Paul Thek at the Carnegie Museum of Art in 2011. In one of Thek’s notebooks was written over and over: get over yourself, get over yourself. If HUMANity is going to survive, we are going to have to get over ourselves. We are going to have to acknowledge that it’s not all about us, that there are countless species with whom we share the planet, and they have a right to their continued existence just as we do. We are enacting a genocide on non-human nature, and we are too busy tweeting and texting to notice. This cataclysmic injustice is not only perpetrated on non-human others who are unable to speak to us in our language. This ecocide is an injustice to future generations who may find themselves in an entirely artificial world and may never know the joy of birdsong, the taste of wild honey, the smell of a forest, or the sensation of walking on damp, spongy soil. A world that is just about us is not a world I want to live in. That world is without a soul. 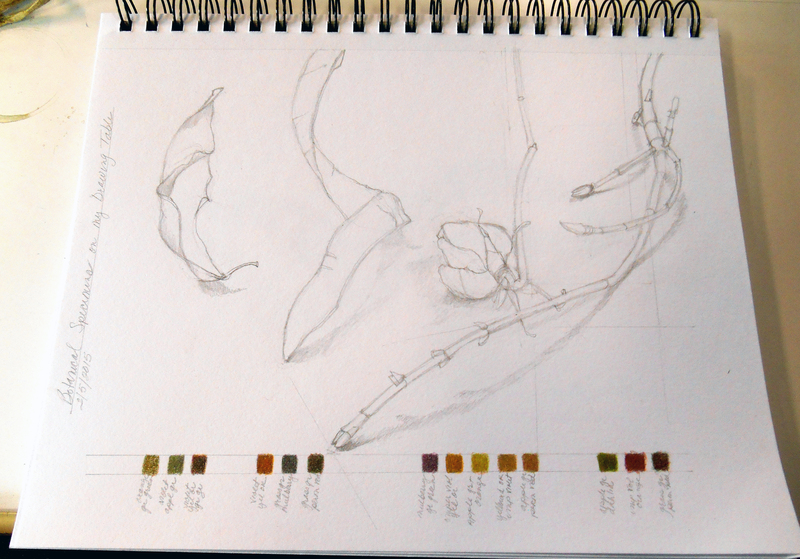 So this all takes me back to slow art—slow not only in the making but in the experience of it. 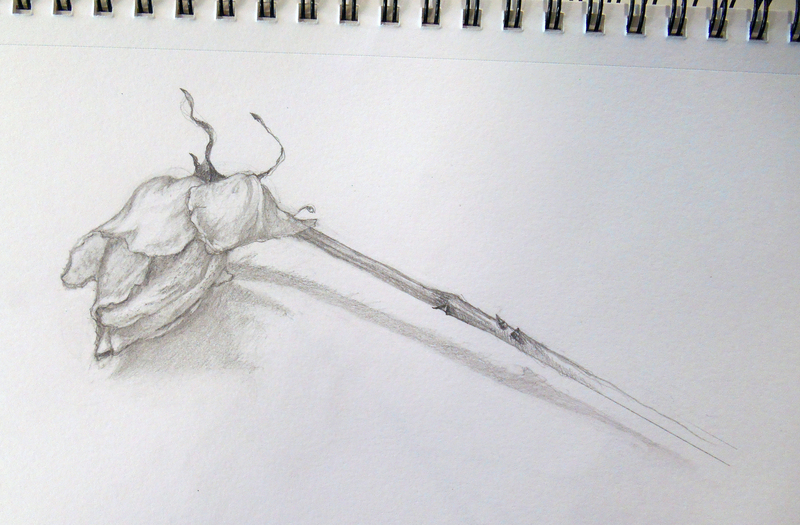 Over the last few years, I’ve been studying botanical art. In its traditional form, I find it is too painstaking and laborious for my temperament, but there is much I am learning from it. 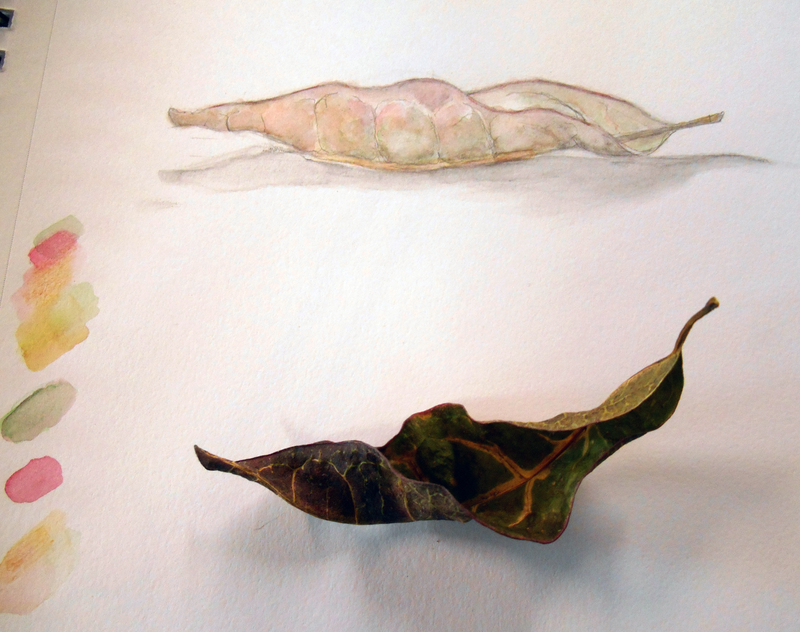 More than anything, I am learning to slow down and look very carefully at a twig, a leaf, a bud, a petal. And the more I look as I attempt to replicate the shapes, the colors, the textures, the more I am in awe of the miracle of nature, of life, of evolution. So I am now working toward integrating this slow process of observation and its resulting imagery into my more contemporary forms of image making—that slow looking and sensing, and that life force. This requires much patience and suspension of self-doubt, for this is new territory. I am experimenting and I am listening. I am keeping the channel open. 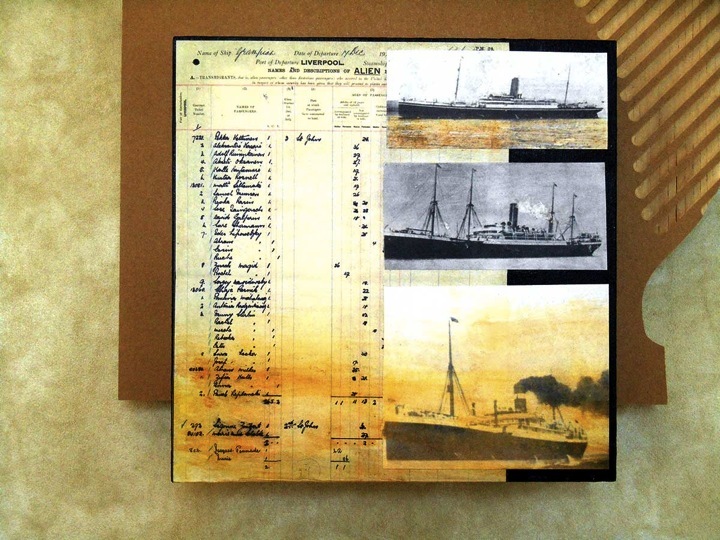 Ruth Fauman Fichman researched our family genealogies for Moving Targets as we transformed our discoveries into mixed media collages. I contacted 14 artists for the Passenger Pigeon Portrait Gallery–each representing a state within the former nesting range. Fabrication for the map backboards was stalling until I finally located professionals to do the job. Trying out my new Richeson baby press was a welcome diversion. 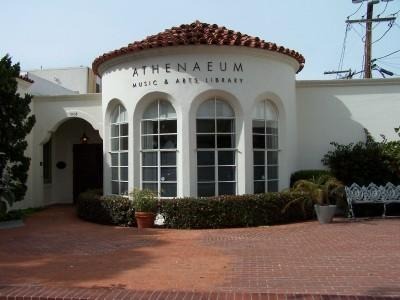 In March, I headed to L.A. to give a lecture at the Athenaeum Music and Arts Library in La Jolla, one of a handful of private libraries in the country. I arrived early to meet up with a high school friend and visit our old stomping grounds in Ojai (below), where we attended what is now Besant Hill School. I also reconnected with friends and family who I had not seen in years. My cousin Harriet and I pored over family photos and compared notes. 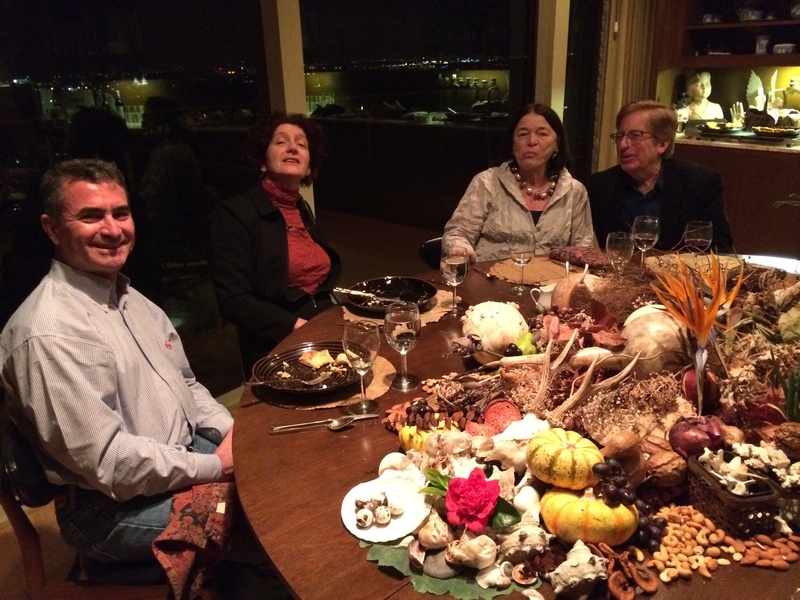 The lecture went well, with a lively conversation led by Robert Pincus followed by a wonderful supper at the home of artist Joyce Cutler Shaw. Steffi and I installed Moving Targets at Brushwood Center (near Chicago) with Ruth. I also worked with Remembering Hiroshima, Imagining Peace (RHIP) and the Children’s Museum to determine a collaborative project to mark the 69th anniversary of the bombings of Hiroshima and Nagasaki. I returned to Los Angeles in June for the wedding of a dear friend’s son. It was a beautiful, relaxed event near Lake Arrowhead, where my family once vacationed. 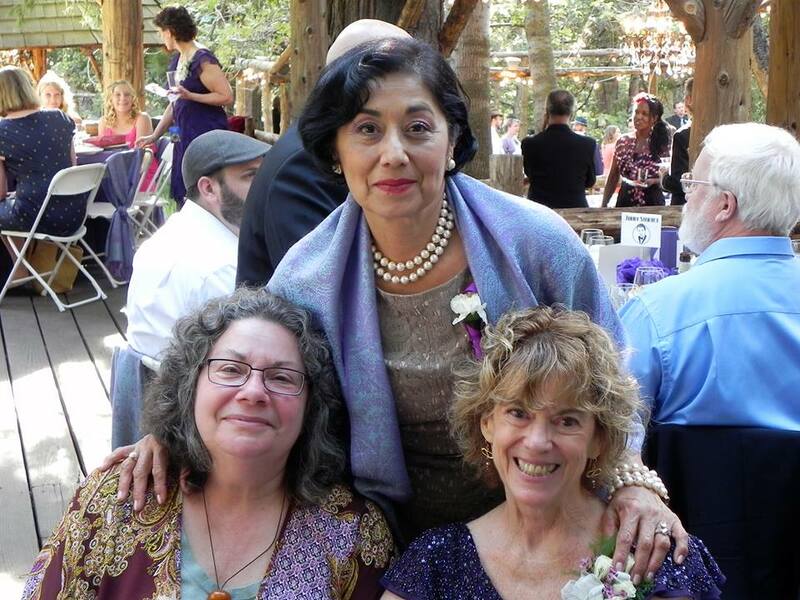 We are pictured here with the groom’s mom (right) and her friend. 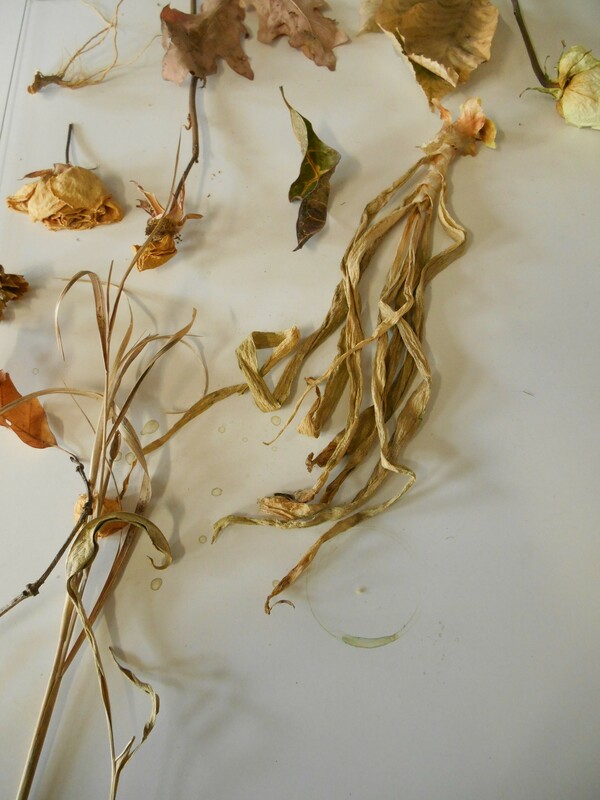 In July, Steffi and I returned to Brushwood to deinstall the exhibition and reinstall the Portrait Gallery at the Art and Environment Gallery, School of Natural Resources and the Environment, UM Ann Arbor, directed by biologist and artist Sara Adlerstein. 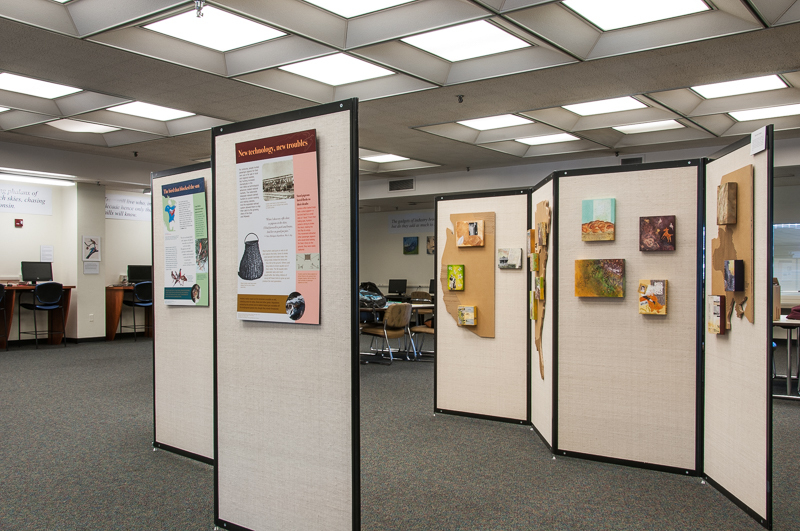 Concurrently, a second exhibition of the Portrait Gallery opened at the Cornell Lab of Ornithology. RHIP marked the bombing of Hiroshima and Nagasaki through a Shibori Workshop at the Children’s Museum and screening of Kurosawa’s “I Live in Fear” at Pittsburgh Filmmakers followed by skyping with students in Japan. 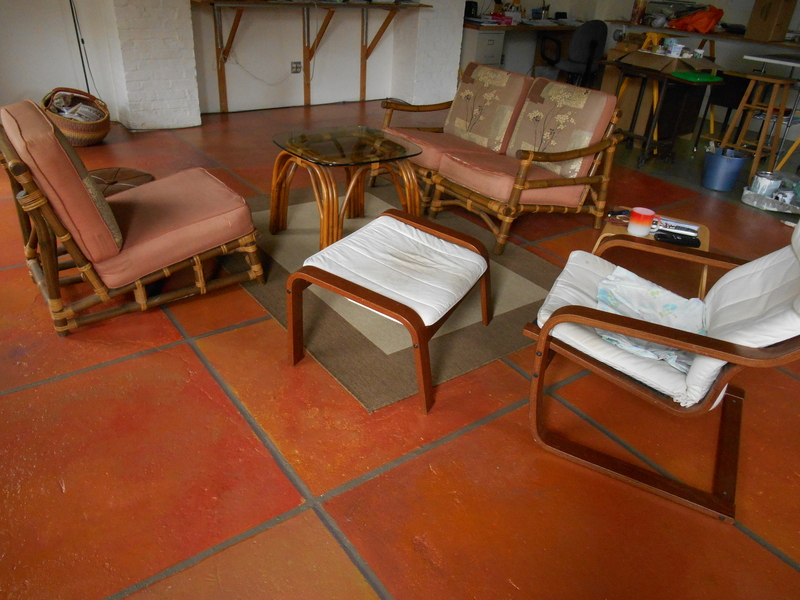 Muralist JoAnn Moran from Connecticut convinced me to let her paint my concrete floor! It was mayhem , but I now have a gorgeous, faux-tile floor. September 1 was the anniversary of the passing of Martha, the last passenger pigeon. Myself and a few other brave souls marked the day by drawing passenger pigeon mounts at the Carnegie Museum of Natural History. On September 19, I returned to Ann Arbor for the Portrait Gallery reception, which included a conversation led by Sara Adlerstein with myself and Joel Greenberg. Joel spoke that evening at the UM Natural History Museum. 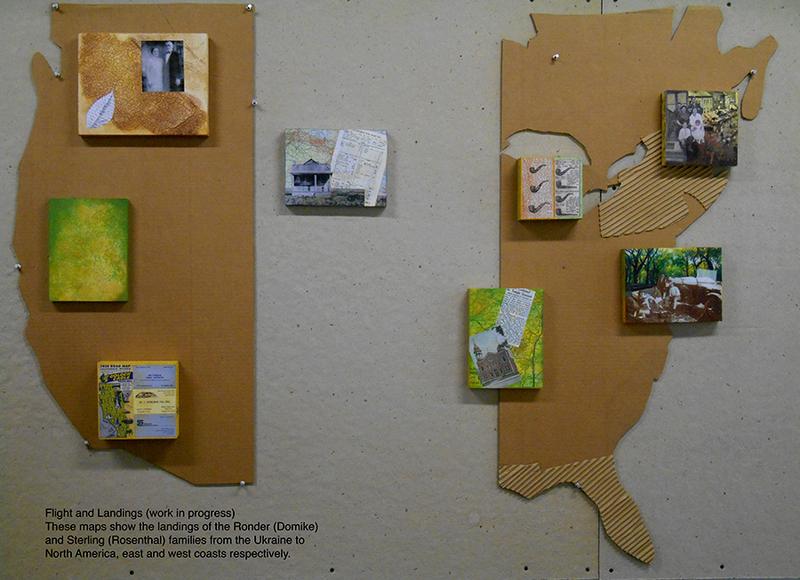 At the end of October, we deinstalled the Ann Arbor show. September and October also featured numerous centenary events in and around Pittsburgh under the umbrella of Project Passenger Pigeon Pittsburgh. 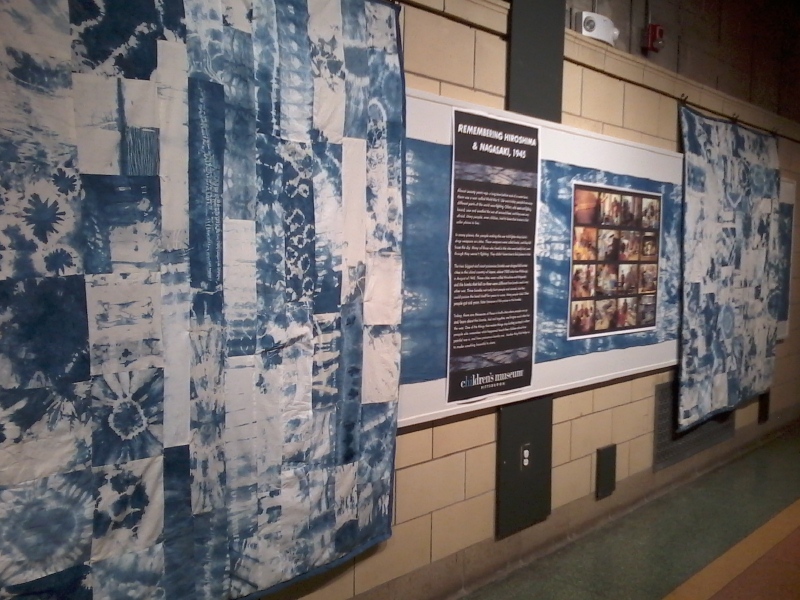 The RHIP Shibori Peace Quilt Project culminated in these awesome quilts made by the Children’s Museum Makeshop. This gorgeous display of the three quilts made us proud. The museum will keep one quilt, one will go to a peace organization in New York and another to a women’s peace organization in Japan. The NYC and Japan quilts will be handed off during the Nuclear Non-Proliferation Treaty Review Conference, convening in New York in April. The Portrait Gallery was reunited with Steffi’s and my work for the final exhibition of Moving Targets at the Gumberg Library, Duquesne University, Pittsburgh. The reception was well attended by family, friends, students, faculty and administrators. Joel Greenberg closed out the year with a lecture at Duquesne followed by a closing reception for the exhibition. With the support of a PA Council on the Arts grant, a professional photographer documented the exhibition. We have seed funding to get us started on a catalog. For the 2015 anniversary of the passing of Martha, we will reinstall the exhibition with the completed catalog. Ann Arbor Show Closes, On to Pittsburgh! 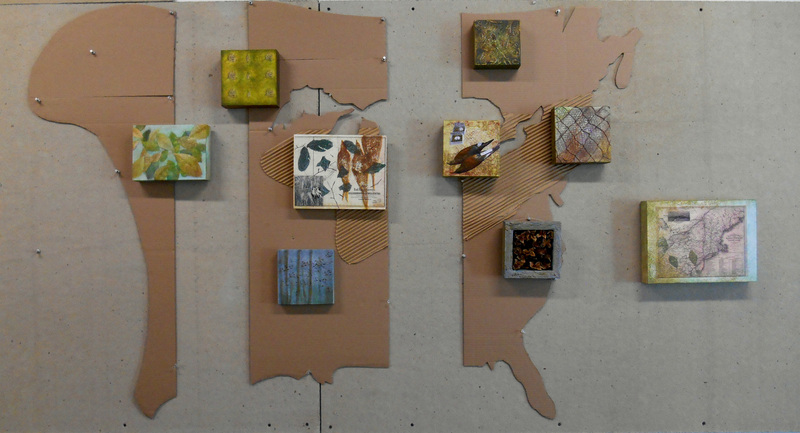 The Moving Targets “Passenger Pigeon Portrait Gallery” featuring 14 artists each representing a state in the former nesting range of the pigeon, had a very successful run at the Art & Environment Gallery, School of Natural Resources and the Environment (SNRE), UM Ann Arbor. 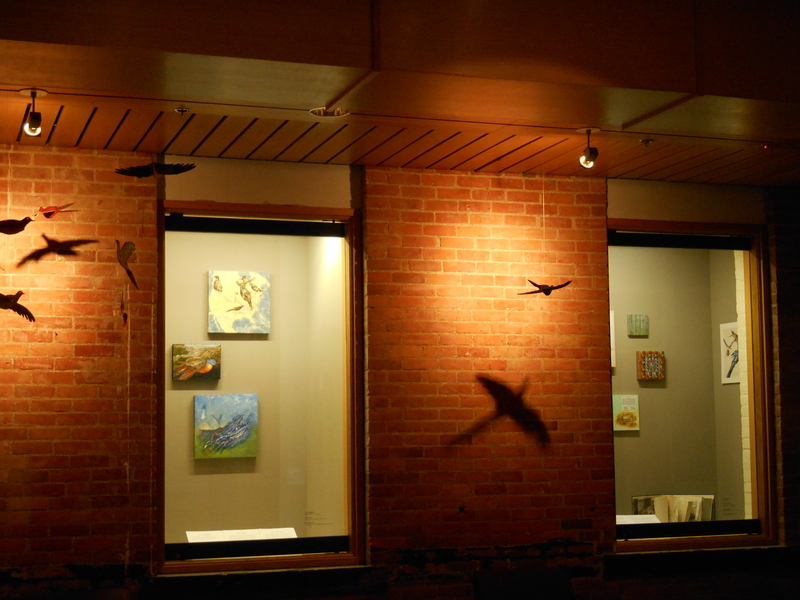 Gallery director, scientist, and artist Sara Adlerstein tirelessly promoted the exhibition and used it as an opportunity to spread the word about the plight of the passenger pigeon. Her graduate students fabricated passenger pigeon silhouettes which were then painted by children through an ecoliteracy program. The birds were then hung outside the exhibition cases. SNRE staff and students created an 8×10 foot mural outside of the Dana Building celebrating the life and beauty of the Passenger Pigeon. Children and members of the public helped in its creation. 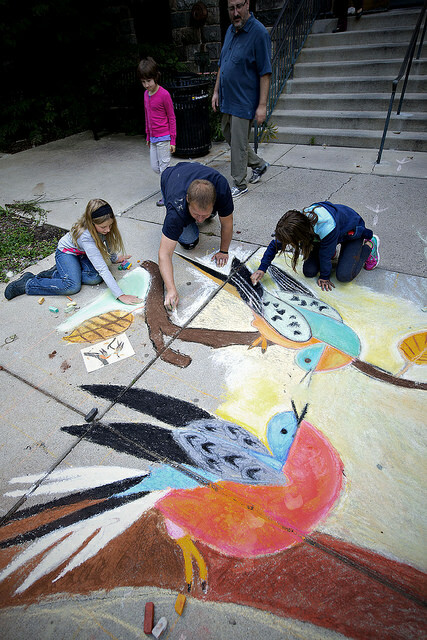 To see the complete gallery of the chalk art mural, click here. The Detroit News children’s education e-magazine featured the centenary, including the Portrait Gallery exhibition. 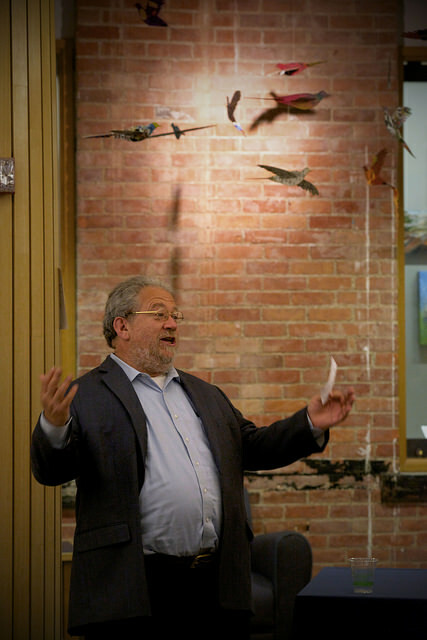 We had a wonderful reception for the exhibition at which author Joel Greenberg (left) discussed the role of art and artists in his national effort Project Passenger Pigeon. Sara and her student team produced a beautiful and informative poster of the exhibition. We are now in the process of installing the exhibition at the Duquesne University Gumberg Library. A reception will take place on November 11, 5-7pm. The exhibition will run through Dec. 6. 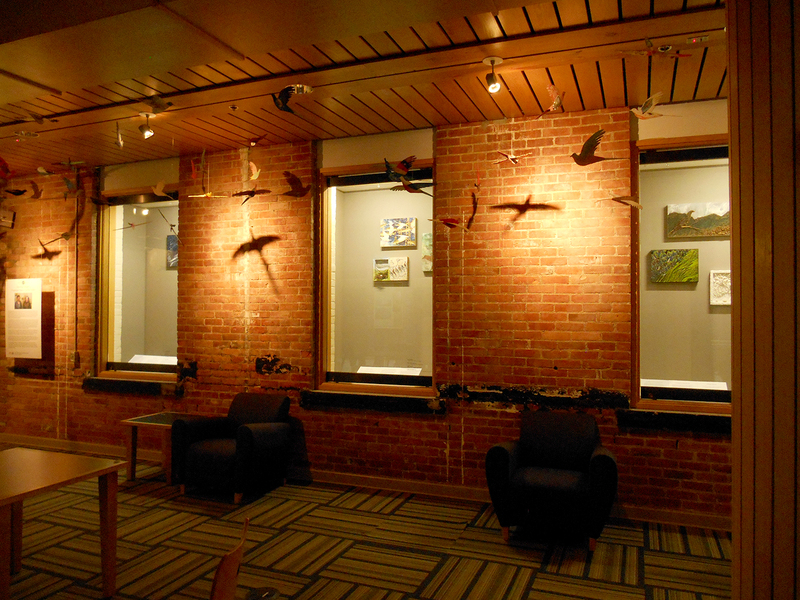 Our “duplicate” Passenger Pigeon Portrait Gallery remains on display at Cornell Lab of Ornithology until the end of the year. Stay tuned for more info and photos of our final showing of Moving Targets! 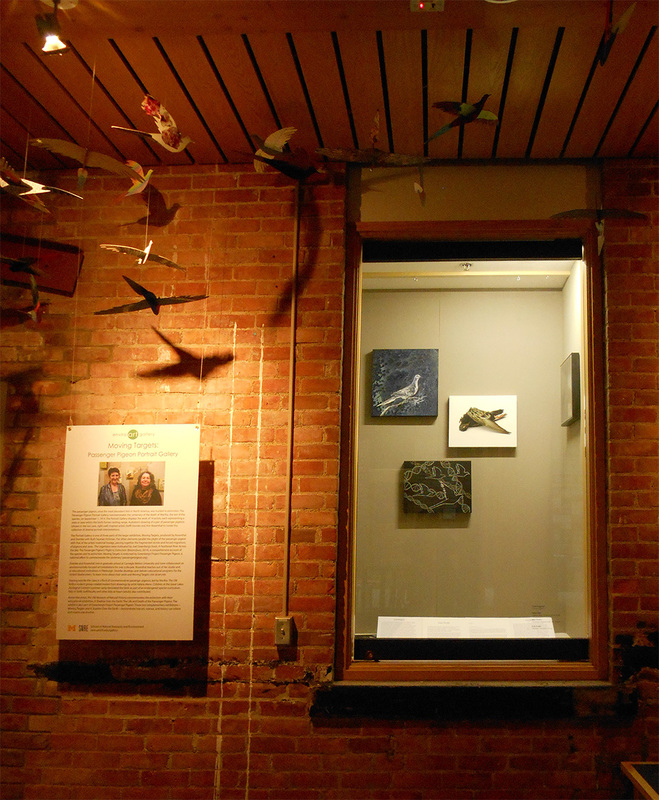 The Passenger Pigeon Portrait Gallery, one of three sections of Moving Targets, is now showing simultaneously in two locations: The Art & Environment Gallery in the School of Natural Resources and the Environment at University of Michigan, Ann Arbor (through October) and at the Cornell Lab of Ornithology in Ithaca, NY (through December). The 14 artists, plus myself and my collaborator Steffi Domike, have each contributed one work that reflects the region in which each artist lives. Combined, the artists represent states within the former nesting range of the passenger pigeon. Art & Environment Gallery director Sara Adlerstein, who is a research scientist at UM and is an artist in the exhibition, talks about the exhibition in a short video as part of an extensive article in the UM Record (be sure to click on Moving Targets on the right and then the “Read More” link for the entire article). Learn more about the project in the Moving Targets section of this site. Moving Targets will be reunited and shown in its entirety November 10 – December 6 in Pittsburgh at Duquesne University’s Gumberg Library. Joel Greenberg will speak at Duquesne December 4. 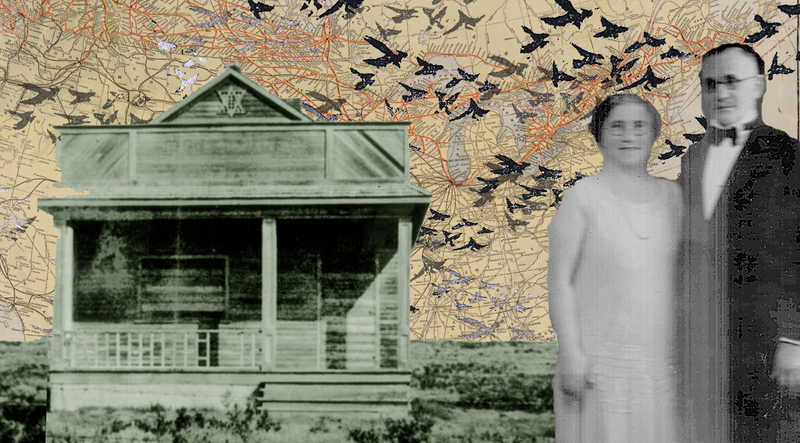 Moving Targets is part of Project Passenger Pigeon Pittsburgh, a coalition of environmental, educational, arts, and historical institutions and independent performing and visual artists. 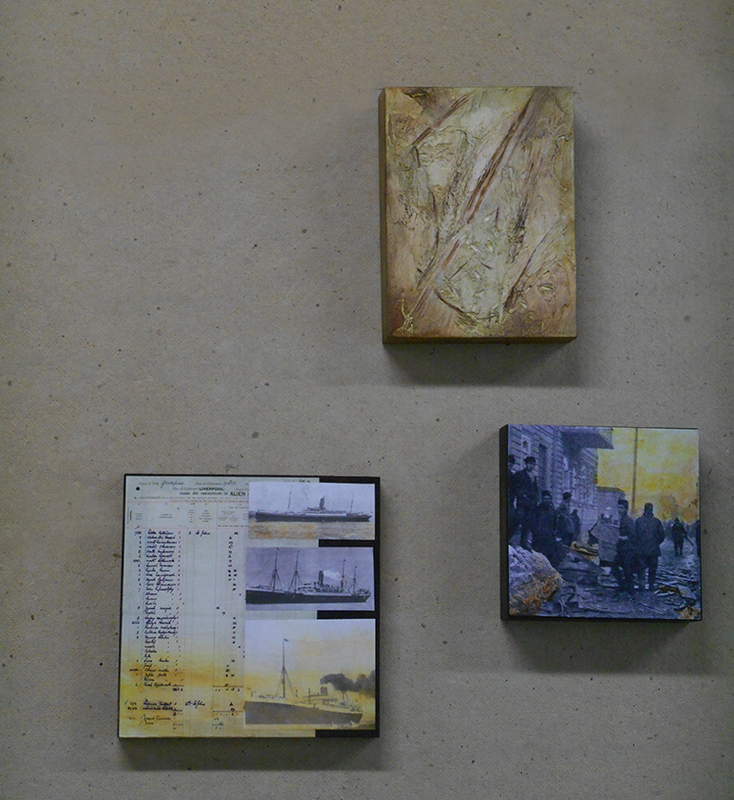 Artwork (above left): Ann Rosenthal, Safe Haven, 2014. In 1910, my mother and her family were making their way across Canada, having escaped the brutal pogroms in the Ukraine. Though the great flocks of passenger pigeons had disappeared by the time of my family’s migration, I like to imagine that their paths crossed as they both sought safe haven in distant lands. After a very ‘quick’ two months at Brushwood Center in Deerfield, IL, Steffi and I will be deinstalling Moving Targets and reinstalling part of it–the Passenger Pigeon Portrait Gallery–at the Art & Environment Gallery in the School of Natural Resources and the Environment at UM Ann Arbor. It will remain there through October, so that the students and faculty who are off for the summer will have a chance to enjoy it. On the left is one of 16 works in the Portrait Gallery: “Ghost,” by Leah Piepgras, 16 x 16, acrylic on board. The portraits will be on display during Joel Greenberg’s talk at the UM Natural History Museum on September 19. The museum is featuring two exhibits on the Passenger Pigeon. Overlapping with the exhibition in Ann Arbor will be a second installation of the Portrait Gallery at Cornell Lab of Ornithology, Ithaca, NY in the Fall. In November/December, the exhibition will be reunited and will be shown in its entirety at the Gumberg Library, Duquesne University in Pittsburgh. The exhibition will be in conjunction with a mini-conference in early December at which Joel Greenberg will be the keynote speaker. Between July – November, Moving Targets sans the Portrait Gallery is available for exhibition. I will post photos next week of the new installation in Ann Arbor. For more information on the project, see a virtual tour of the exhibition, and hear podcasts of the artists discussing their work and research on the Moving Targets page of this web site (click in the menu bar above)! Ten days to wrap up Steffi Domike’s and my two-year project, Moving Targets, with Ruth Fauman-Fichman, which will be shown at Brushwood Center at Ryerson Woods in Deerfield, IL (North Chicago). Still working on a few final pieces, and we have to assemble everything, but here’s a sneak peek. (See my 1/16 post below for background on the project). This map represents the passenger pigeon migration range. The textured area marks the principal nesting grounds. The narrative will continue through four posters produced by University of Michigan Museum of Natural History for Project Passenger Pigeon (with which our project is affiliated). The posters will lead visitors into the Brushwood Library where we will mount a Passenger Pigeon Portrait Gallery. We have invited 14 artists, each representing a state within the nesting range, to produce a passenger pigeon “portrait” for this part of our exhibition. See some of the portraits here. 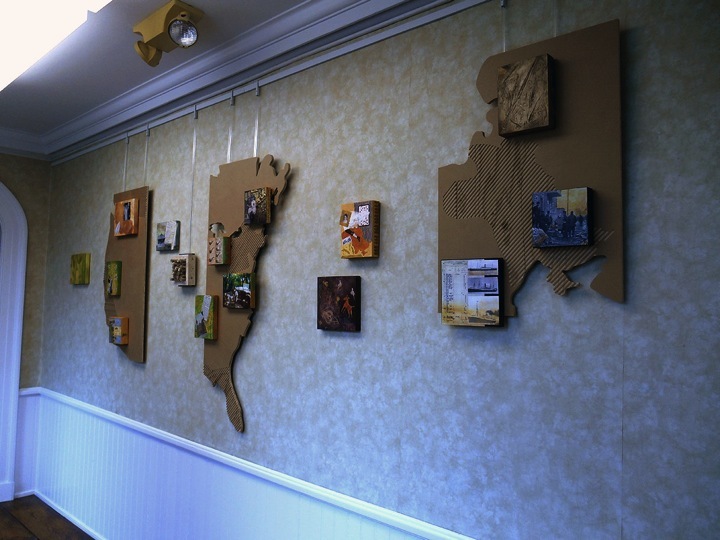 These works will be hung on a map of the Ukraine (not shown). The image on the right is from a newspaper of the early 20th century depicting the aftermath of a pogrom. On the left are ships that transported our families to North America with one ship’s manifest listing my family members. The top-most piece is an impression of wheat, a staple crop of the Ukraine and a staple food for most families. Steffi’s forebears were also wheat traders in the Ukraine, and mine farmed wheat in Canada after immigrating there. These maps show the flight of the Ronder (Domike) and Sterling (Rosenthal) families from the Ukraine to North America. East to west, the textured areas represent where the Ronders landed in the eastern U.S., and where the Sterlings settled, first in Canada and then California (textured areas not shown on westcoast map). 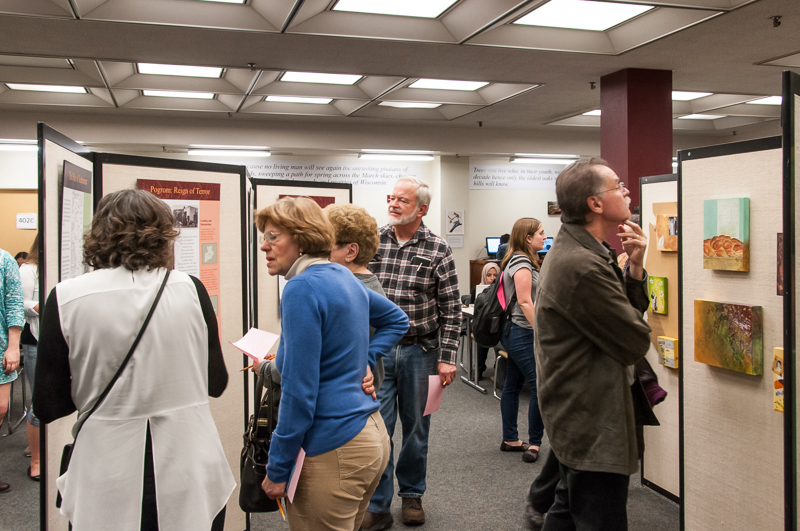 For the Brushwood Reading Room, we have created four posters, comparable to those for the Passenger Pigeon and in the same format, that recount the history of the Jews in relation to our family stories. The poster content was developed by Ruth, who also located many of the images and maps, and pursued the permissions to use them. She and Steffi worked tirelessly to condense and present the text and images in a compelling narrative. The actual maps have been cut out of MDO board and will replace the cardboard mockups above. There are additional pieces that will go between the maps and on the opposite walls. 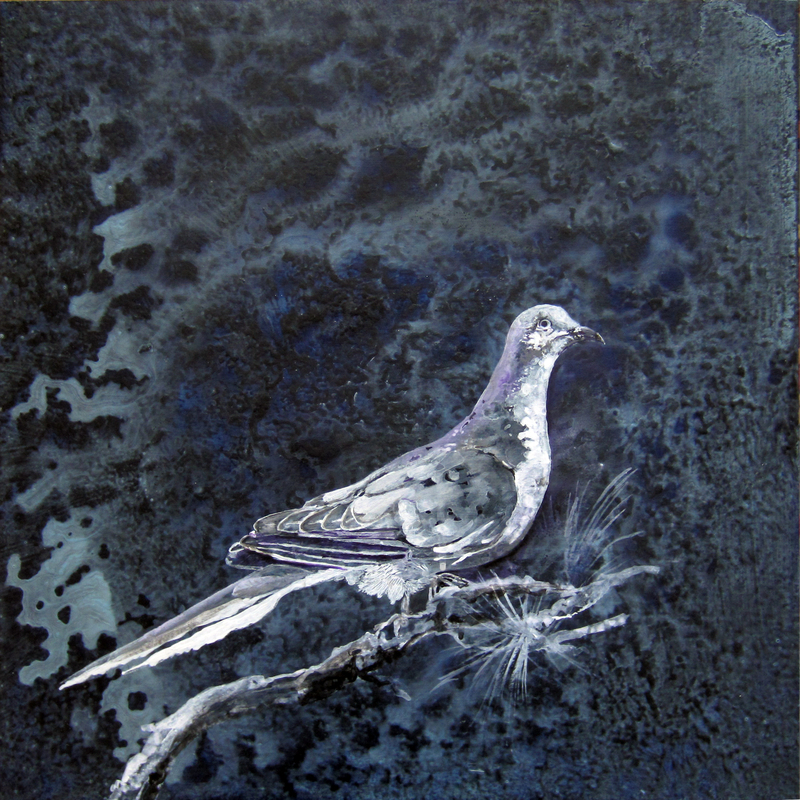 The exhibition at Brushwood will run May 4 – July 3. There will be a public reception 1-3pm on Sunday, May 4. The Smith Nature Symposium at Brushwood on May 17 will honor Joel Greenberg and feature scientist Beth Shapiro as the keynote speaker; our exhibit will be highlighted for the attendees. After the Brushwood exhibition, the Portrait Gallery and some of our work will be shown at the Art and Environment Gallery in the School of Natural Resources and the Environment at University of Michigan, Ann Arbor. We are in the process of locating a space in Pittsburgh for the Fall. We welcome inquires for possible exhibition of Moving Targets! 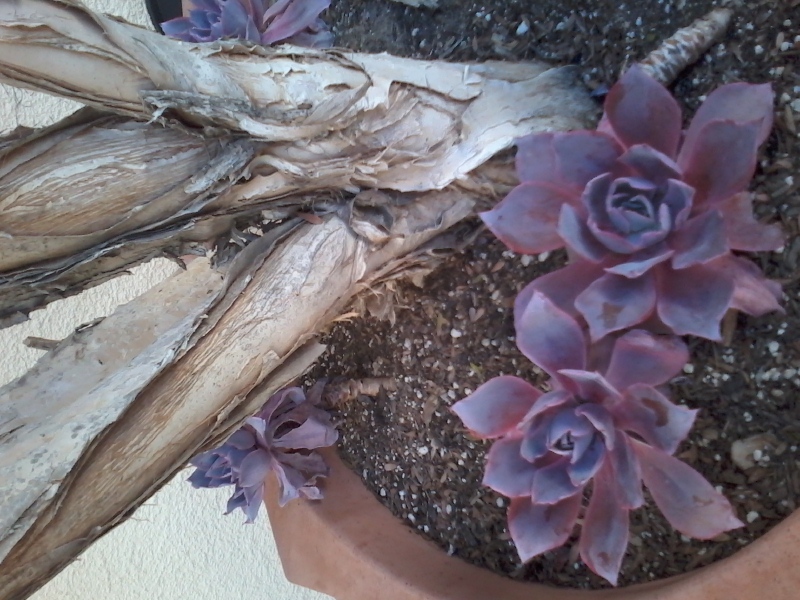 It’s been two weeks since I made my sojourn to Los Angeles–my place of birth. I hadn’t been back for seven years, since my partner passed. The impetus for my visit was to give a lecture at the Athenaeum Music and Arts Library in La Jolla, but I arrived almost a week early to visit old friends and haunts. 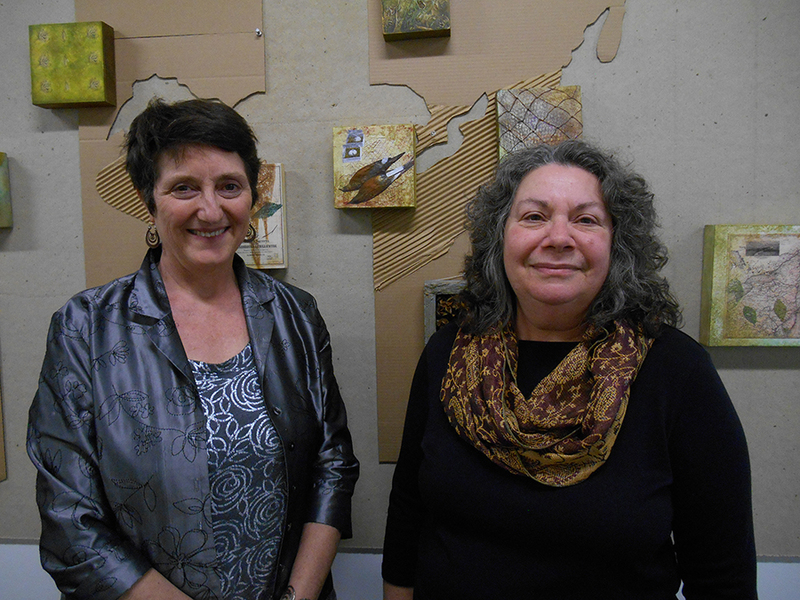 I spent the weekend with an old Women’s Caucus for Art friend, Lucy Blake Elahi. I am always so inspired to see my friends of many years still making art, still exploring and learning. It was like we had seen one another a month prior instead of several years having passed. On Saturday I headed to Pepperdine University with Lucy and her husband Faz, my college art friend Ralph Loynachan, and glass artist Gina Michel to see an exhibition of Wayne Thiebaud’s prints. Since I have been getting back into printmaking, the show was food for a hungry heart. Such exquisite drawing with the most basic of forms for his cakes and pies, and then more recent work of distorted and whimsical landscapes, employing a wide range of print media. I soaked it all up with my friends. The weather was glorious. After our very long and cold winter in Pittsburgh, I felt released, other than the bumper-to-bumper traffic. 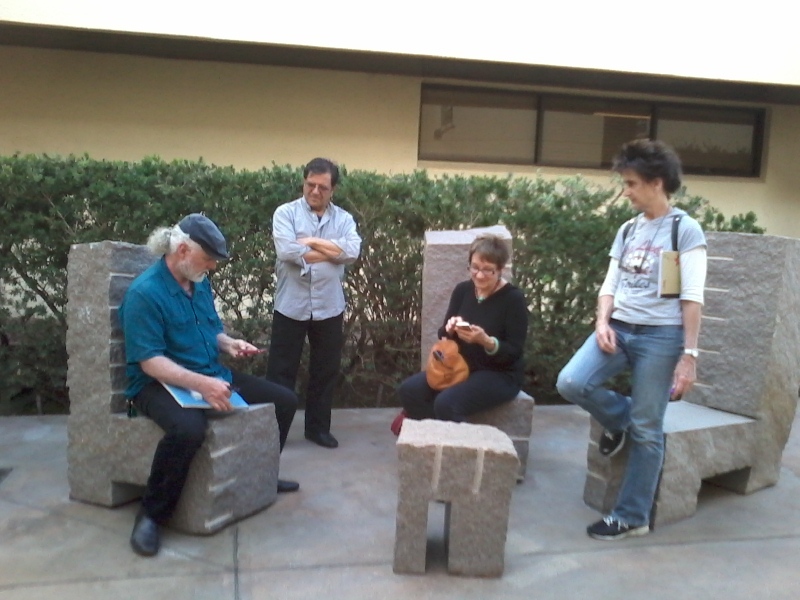 The next evening, I joined Lucy for her dream group that meets once a week. Each member of this small group draws his/her dream, and then everyone interprets it. The mood was respectful and trusting, and the comments were very insightful. I wasn’t going to participate, but was lured in and drew an older but significant dream. It was interesting that I did not draw exactly what the dream was but perhaps its outcome or result. 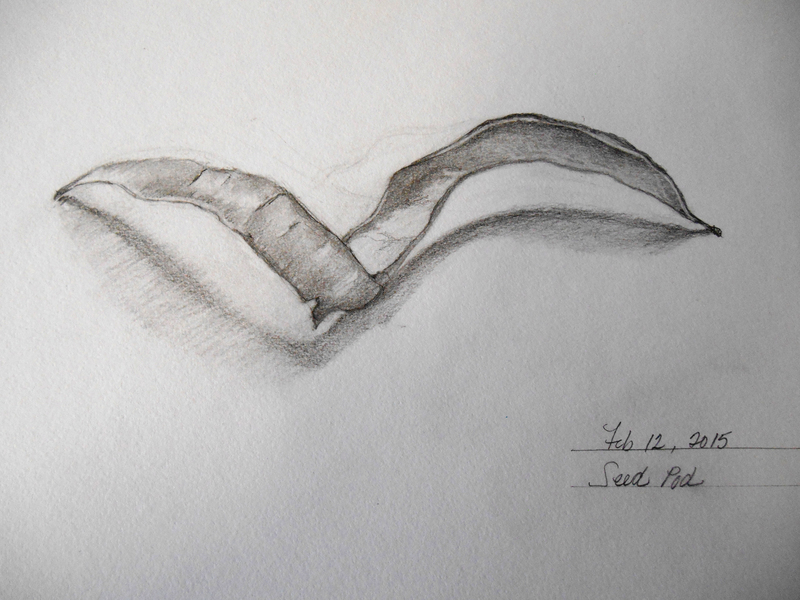 Where the dream was a bit scary and dark, my drawing was embracing and hopeful. The interpretation by the group was very revealing and moving for me. A wonderful and healing experience. 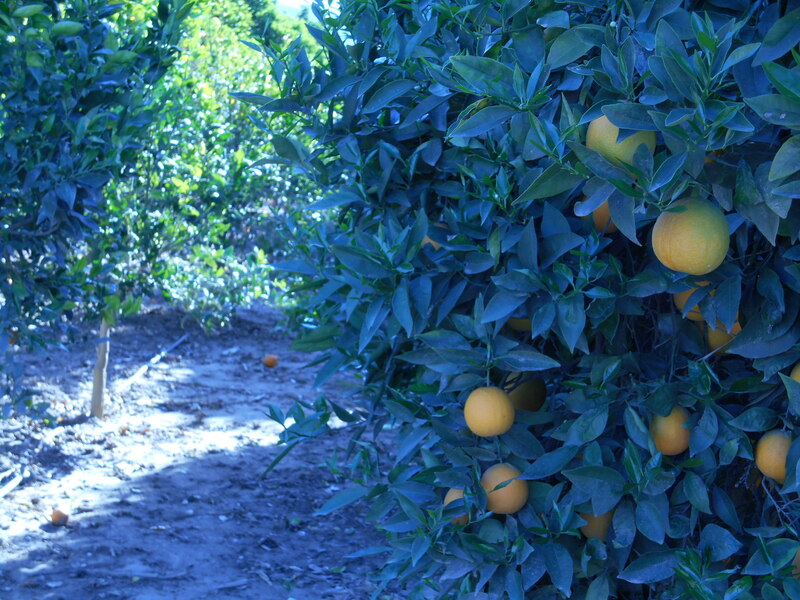 On Monday I met up with my high school friend Suzanne Schumacher and we headed to Ojai to visit transplanted Pittsburgher, Wendy Osher. More glorious weather with crystal clear, blue skies and the ocean to our west as we headed north. 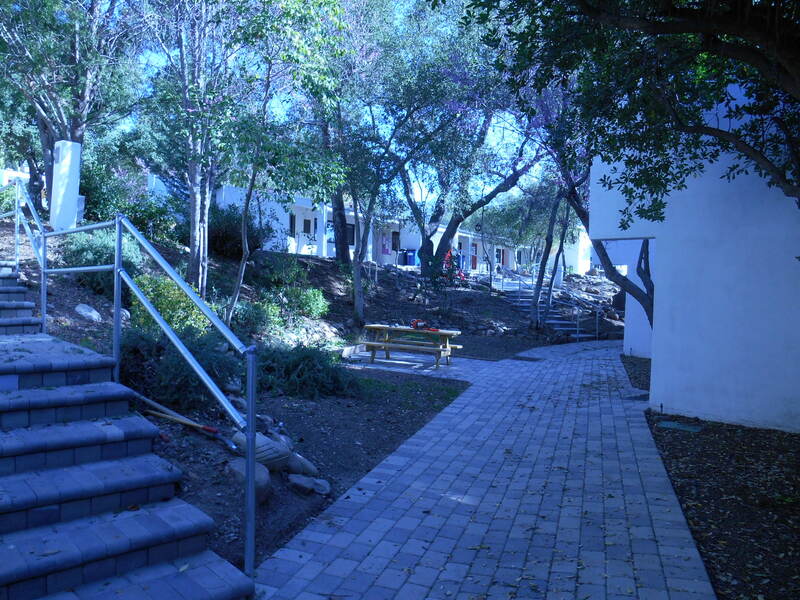 Susanne and I spent our high school years in Ojai at what is now renamed Besant Hill School (formerly Happy Valley School). One of our intents was to pay tribute to two classmates who had passed this last year. We found a text we liked from Krishnamurti, who spoke often at the Oak Grove above our campus. 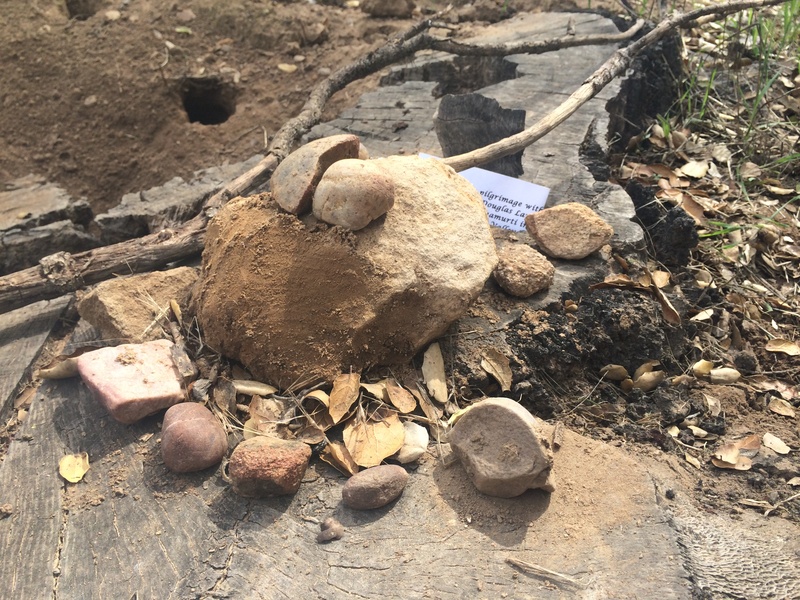 We created an impromptu earthwork of stones and branches in the Grove, and read the text, which we left there. 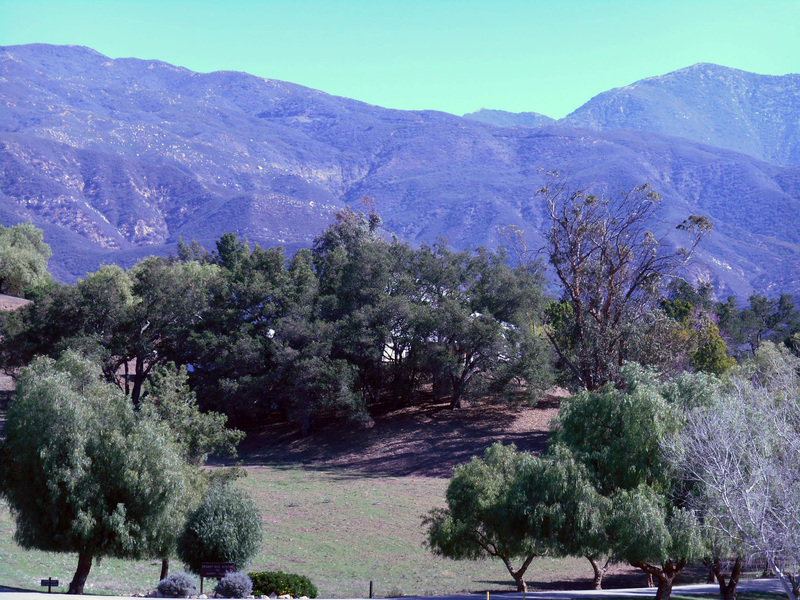 On our way out of Ojai the next morning, we visited what is now the campus of the school in the upper valley. In our day, it was the site of the older boys dorms, who were bussed down to the lower valley for classes. It is sad that the original school building has been razed, but the upper valley campus is wonderful. We had a brief chat with a few of the administrators and hope we can arrange a week-long residency there in 2016 as part of a reunion they are planning. For the final leg of my journey, Susanne and I headed down to La Jolla the night prior to my talk. I spent the next day finalizing my text and slides. My talk was well received. Robert Pincus was the discussant following, and we had a thoughtful conversation about my work. It felt deeply satisfying to have my thinking and work so acknowledged, and to have my two life-long friends, Ralph and Suzanne, present to cheer me on. Following the event, artist Joyce Cutler Shaw who has organized this lecture series for years, invited a group of us to her lovely home for a delicious supper around a lavish still life. A grand finale to a perfect day. Heading back to L.A., I spent my last evening with my cousin Harriet, who I had not seen for more years than I can recall, but again, it was as though no time had passed. We pored over family photos and caught up. It was a glorious trip–the embrace of the sun and surf, treasured friends and colleagues, creative and attentive exchanges, common causes and concerns. It was a much needed infusion that will carry me through this next month as I wrap up Moving Targets and head to Chicago.